please how can i fix the problem. ?? kindly add this to the list as not working. (even if the above comment solved your issue). Remove the & doens't seem to work anymore. I just tried the plug-in, made that change and admin is still blank. Did you delete the .ini files from the cache after you made the changes in the plugin? Did you disable the plugin before the changes ? Disable the plugin and then delete the ini files from the cache then remove any routes you created from the config.php or settings from the plugin and test again. Make sure you create the correct route for the page you make. This is a simple plugin that lets you make more pages and keep them in the same folder. Other than the route you create there is little chance this won't work. I click the link on the left "Custom Pages" but then /forum/plugin/page/default/admin is just blank. I deleted the plugin, changed the &$ to $, then uploaded the plugin, deleted the .ini files, and enabled the plugin and the page mentioned above is still blank. I didn't get a chance to make routes yet. I guess you see that when the plugin is working? Maybe you should try the ExtraPage plugin by peregrine, it is a more user friendly for starting I love that plugin it is the father of many plugins I made. The route is what determines the url for the page so it is critical to make a route or you will get a blank page or 404 and if your code is bad or has syntax errors you will also get a blank page or a 500 error. To be able to troubleshoot this further you will need to add a configuration to your config.php temporarily and when done comment it out with // before it so people don't see it in case of error. This should display the exact error whatever it is and a ton of code and functions involved in the error. This way you can better know what is happening while you set this up. I have a simple form on the website that takes a username and password and submits it one time to an MSSQL database. I am just trying to find a way to hide the form inside of the forums for players only.. So new players have to register on the forums first, then they can access the register game account page. A plugin would work best it seems, but I have no idea how to get the plugin to show a form and submit to mssql.. I really want to replace our small site with running Vanilla from the root directory since we now handle support, and everything through vanilla.. I just can't figure out the best method for hiding that page.. Vanillia takes care of spam blocking, email verification etc.. something our poorly designed register page doesn't do.. I will try the extrapage-plugin and see if that will work. He just updated that with role permissions so it would seem that would be the way to go. You can set the permissions for only registered users so only they can access the form. Thanks for your time.. I tried the updated version. But the form posts to itself using ?add=1 but then the page returns a 404. Maybe I will have to use some other method or get the register page re-written to be more secure. If you get a blank page in Vanilla, you need to enable debugging to get the actual error. 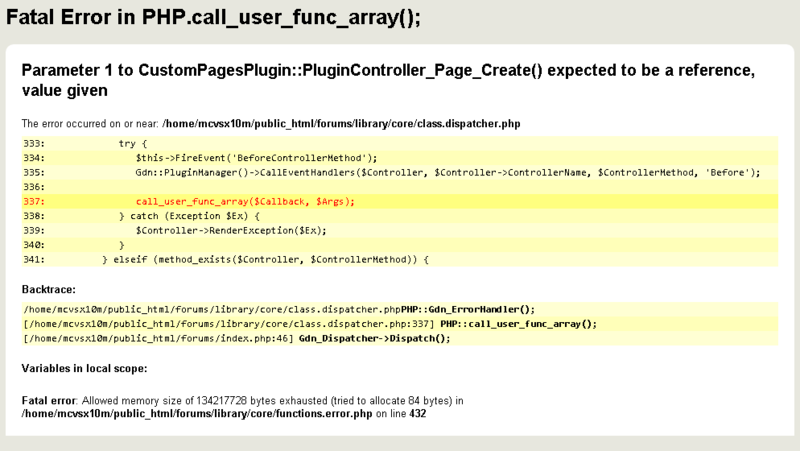 You can enable debugging by adding $Configuration['Debug'] = TRUE; to your /conf/config.php file.